Here’s an intriguing concept, personal bodyguards for Cobra Commander. I thought he already had them in the Crimson Guard? Anyway, this figure is a mashup in need of a little more mashing. The Range Viper head sculpt I find to be one of the oddest in the RAH line. Is the top of the helmet supposed to resemble exposed brain? It’s very weird, and with the skull face, evokes the Mars Attacks Martians. I suppose the look works better for Cobra Commander’s Imperial Guard, who I assume are meant to strike fear in anyone who would try to attack or assassinate the Cobra leader. As a whole, the figure just doesn’t work. The combination of the Range Viper and Battle Armor Cobra Commander parts do not play well with each other. The Imperial Guard comes across as neither regal nor intimidating. I’m more reminded of decorative gargoyles that sit atop gothic churches. The figure doesn’t seem too threatening. The colors don’t do it any favors either. 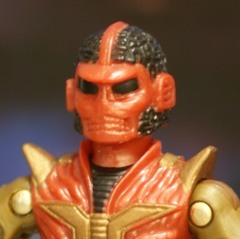 Rather than the traditional Cobra Crimson Guard red, the molds are cast in a kind of dull metallic red that looks like hard candy. The gold color doesn’t contrast well, and the resulting look is oddly drab. 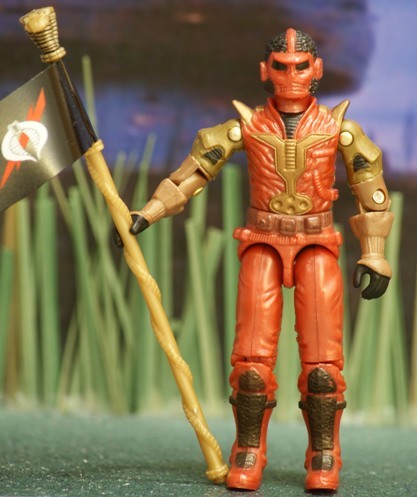 The lone accessory, a Cobra flag, isn’t a bad inclusion, but it would have been nice to have armed the Imperial Guard, even with a melee weapon. I suppose they can beat someone senseless with their flagpoles if need be. That is a pretty uninspiring figure, but I do like the flagpole. -Anti-Venom Task Force–kept everyone except Duke (replace him with Airtight using the V1 figure) and Roadblock (replace him with Stalker using the ’94 mold), have Stretcher (like originally intended) instead of Lifeline. Keep Charbroil’s original specialty. -Cobra Urban Strike team–replace Alley-Viper’s legs (with those of a retooled V1’s) and weapons, keep the Flak-Viper name (and give him a decent missile system), replace Storm Shadow with Cyber-Viper (as a comm-specialist), use the ’92 Firefly mold for the Firefly included, give Scrap-Iron some better weaponry. -Desert Patrol Squad–give Ambush his original head, helmet, and weapons, give Gung-Ho his ’92 machine gun and backpack, use the ’91 mold for Dusty with his original gear, replace Snake Eyes with Flint (using the ’94 mold) and Stalker with Roadblock (using the ’92 mold). -Night Force–rename Short-Fuze Downtown (and include his gear), replace Flint, Tunnel Rat, and Roadblock with Lifeline (using the ’94 mold), Lady Jaye (using the original mold), and Low-Light (using the V1 mold). -Crimson Guard Force–have both Tomax and Xamot in the pack (with the Action Marine legs instead of the Headman ones), have three Crimson Guardsman as officially released, replace Firefly with the Crimson Guard Commander (using the ’93 mold). -Cobra Imperial Procession–use the ’91 mold of Cobra Commander (the one that came with the glider-thing), replace Baroness with Dr. Mindbender (using the upper half of the ’93 figure with the lower half of Laser-Viper), and replace these Imperial Guards with Serpentor (in the colors used for them), Overlord, and two Night Creepers. -Winter Operations–replace Backblast with Cold Front, have the Snow Job mold used AS Snow Job (include original gear), replace Mirage with Iceberg (using the ’93 mold), have the Blizzard mold AS Blizzard (use “Sgt. Blizzard” or something), and replace Stalker with Frostbite (using the ’93 mold). Would, except….I don’t even own any of those sets!!! Why night creepers? They are mercs, not guys you’d trust as body guards. Why they didn’t use the Crimson Guard Immortal? They’d do that, they’d sit on mold that fans would love and then toss some crap together. Storm Shadow and Night Creeper were in the Urban Strike set because fans voted they want to see that one and those were two of the characters listed. I’d have been okay with it, if it had been 1988 Storm Shadow. Dump the Vypras from the Cobra Ninja set, or make new heads. The GI JOE infantry set needed better heads, too. Crimson Shadow Guard didn’t need to exist. Just make a Cobra Night Force, included a CG, but also Night Vipers and some other troopers. +Night Creepers are now replaced with CGI’s for my IP set. +Why do we need two ninjas for an urban-themed set? Like I said, that was just my idea of what I would make it consist of. +Maybe renamed the Vypra twins something non-confusing with the ’98 figure? +What kind of heads would you have used for the GI Joe infantry set? +Replace Shadow Guard with something like, say….a Cobra Sea Power set? You see a half-exposed brain, I see a Jheri curl! I thought his head was supposed to be jheri curl. I can hear “Just let your soul glow” in the background. Should also read the other comments before posting. FML. This set was a good idea and have been awesome with the right molds. But it was terrible. Hasbo mailed it in on all the tru sets after the urban/anti venom wave and the 05s became a disgrace. The joe team pulled the has set at the 05 convention due to embarrassment. This set deserved its fate as a $4 clearance item. Can I defend his figure? He is actually one of my favourites with the very bold colour scheme and I really like to Battle Armour/Range Viper mash-up aspect. Wouldn’t the Imperial Guards protect Serpentor instead? I mean he is the Cobra Emperor, after all.